A veteran Manchester United journalist once described by Sir Alex Ferguson as "part of the fabric of the club" has died. 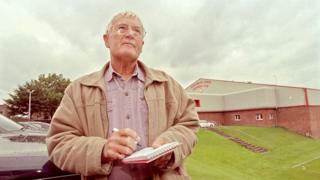 David Meek covered the team's fortunes for the Manchester Evening News from 1958 until his retirement in 1996. The newspaper said he was "one of the great authorities on United" and had "inspired a generation of journalists". Steve Bates, chairman of the Football Writers' Association, confirmed Meek had died aged 88. The popular writer took on the job after fellow MEN journalist Tom Jackson was killed in the 1958 Munich air disaster. In 1995, he earned Sir Alex's loyalty after supporting him at a time when some fans were questioning his future. Writing for the BBC in 2013, Meek told how he defended Sir Alex during a controversial phone-in poll on whether Ferguson should be sacked that summer. "The result of the poll showed a majority in favour of him going and I was asked to write a story accordingly," he wrote. "In fact, what I did was argue that if you deducted the votes of Manchester City fans wanting to cause mischief and you took into account the United supporters who couldn't be bothered to ring in, you were left with an overwhelming vote of confidence in Alex Ferguson. "That was the moment I became a 'Fergie man', close enough to help write his programme notes for 26 years." In 2005, Meek described a George Best strike in the 1966 European up quarter-final second leg against Benfica as "the finest goal" of the many he had seen in decades covering the club. "I can remember leaping to my feet against all etiquette of the press box, so stunning was the fluid, scoring movement and so remarkable the circumstances," he said. Sports journalists and other football figures have paid tribute to Meek. The Times chief football writer Henry Winter tweeted: "Can't believe Meeky's gone. Went on so many trips with him, covering Manchester United. "So generous with his time and advice. Meeky was just the loveliest man, a beacon of calm, great company, a journalist of insight and integrity. Thoughts with his family. Such sad news. RIP."